The last day of June but still flowers are yet to bloom. The meadow’s time has not been missed. On Farthing Downs the gate’s latch clicks and ringlet butterflies jig between grasses. Lady’s and hedge bedstraw cover patches in a lemon meringue mattress form, a reminder of the microcosms of grasslands: dampness, the presence of certain rock or regular disturbance – it all leads to diversify the plants that appear now, and where others want to be. Skylarks still have songs to sing, as do yellowhammers, a song thrush down in the woody field edge. Crows half-heartedly mob a sparrowhawk with prey clasped between its talons. On the lower slopes hundreds of meadow browns, ringlets and skippers cross the path sheltered by trees and the adjacent slope. It is that sense of abundance that so many lament losing. These chalk grasslands, managed with the long-view in mind, are the exception here on the edge of London. 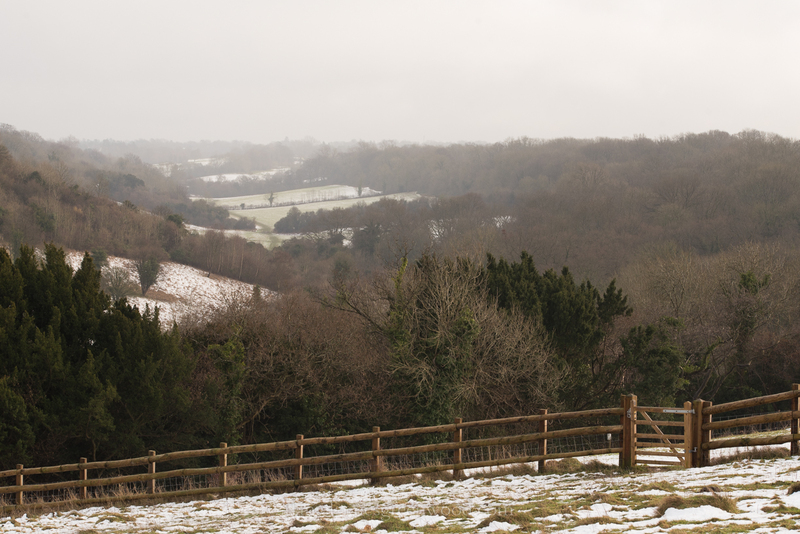 For centuries the North Downs have felt like an escape route from the city. Don’t forget that for thousands of years people have tramped the Pilgrims’ Way to the sacred site of Canterbury. To me they feel like a doorway to something better, somewhere free of the city’s ills. Somewhere you can breathe, where a wild, pastoral world still reigns. In truth it is just a thought and the reality remains different. It’s quiet but I meet people walking dogs. A woman admires spikes of rosebay willowherb, remarking in a strong Indian inflection: ‘beautiful wildflowers’, snapping them with her camera phone. Another lady with a hint of Yorkshire in her voice says how delighted she is to watch marbled white butterflies. Whilst examining hogweed flowers a woman from the north of the border asks what I’m looking for. There’s a parasitic wasp with full ovipositor raised over its back like a scorpion ready to sting – of course it does nothing of the sort. ‘I’m looking at the thing that made Darwin think there was no God!’ I say. Her eyes widen, she looks away, and she knows exactly the thing I mean. ‘I remember reading about them,‘ she says. Ichneumon wasps insert their needle-like ovipositor into their prey, laying an egg which pupates into a grub that eats the prey from within. Sitting to scribble this on a desire line between pyramidal orchids, vetches, marjoram and clover, a scorpion fly rests momentarily and horseflies make their attacks. They perch on my bag with turquoise compound eyes and trowel-like mouth parts. I flail my arms like a chimpanzee, mindful that a dog walker may soon approach and offer emergency first aid. These downs hold great riches, some of which only want your blood. I pass through the gate onto the downs and a fox crosses the lane, that long, fluffed up tail and jinking stride. It seeks the safety of the woodland edge. 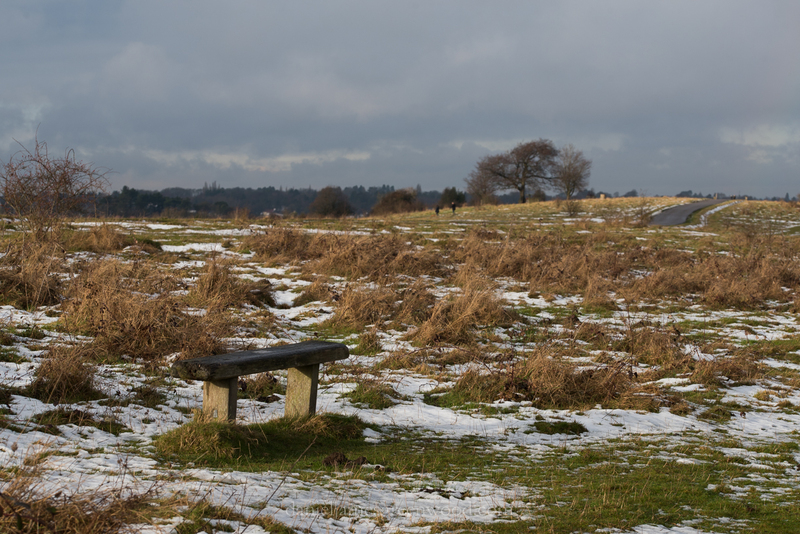 Snow lingers on the downs, magpies feed in small groups. When they fly up it’s not unlike slices of snow lifting off the ground. Their strategy is simple: feed until a bigger beast passes, sit in the trees, then return. The sun breaks the dough-like cloud, a kestrel cutting through with ease. 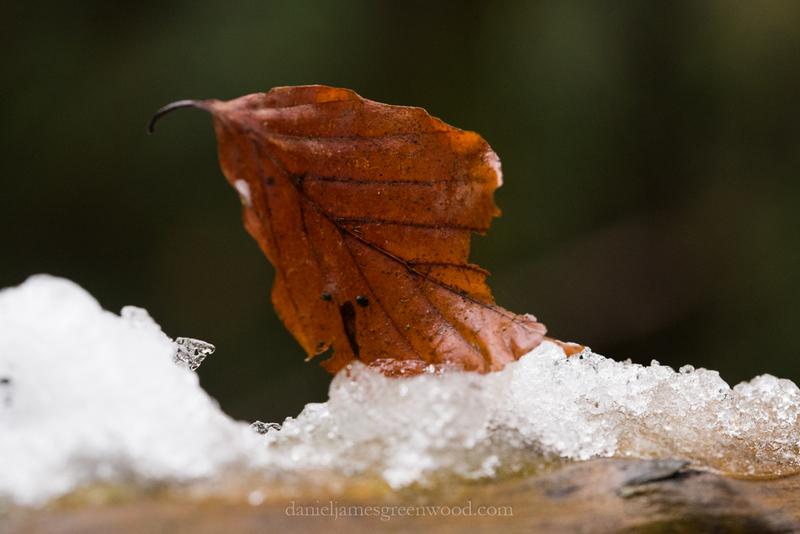 She finds the tip of a branch and balances, the twig bending under her weight. She looks out across the snow. Feeling herself perhaps too exposed, she shifts to the fox’s wooded margin. Restless, knowing she is now unwelcome in open land, she cuts west and disappears over the hill. 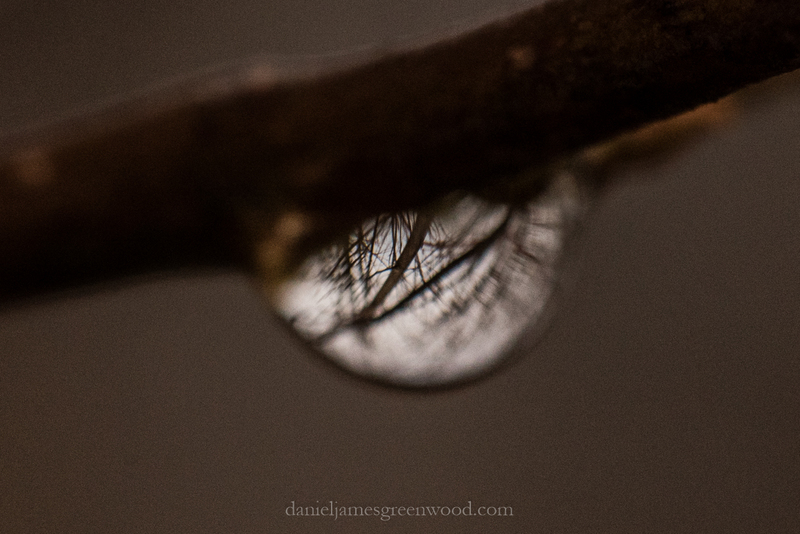 The hazel scrub carries beads of melted ice, hanging long out of the breeze. The shapes show black branches like little snow globes, a looking glass into some dark wood of elsewhere. On the ground the snow carries tokens of those living things that have since passed: dog, human, crow. In between them the stems of wild carrot persist. On the steepest slopes of the downs, sleds slip across the scene, their crew dressed in pink and orange, the colours of our mass production garment industries. On the eastern slopes of Happy Valley the snow rests without the patchiness of the highest point. Yet more magpies are driven from piercing their bills in search of soil. 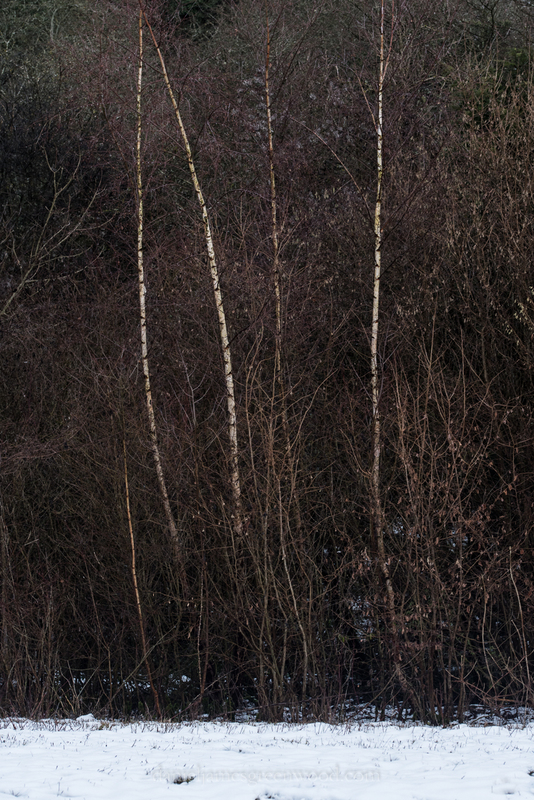 At the bottom of the hill birch trees reflect the snow’s whiteness, their reddish hue shows they are not whiter-than-white. I heard a radio programme recently charting the decline of snowfall in Kent over the past fifty-years. It brought the presenter to the point: might snow become a thing of the past in southern England? 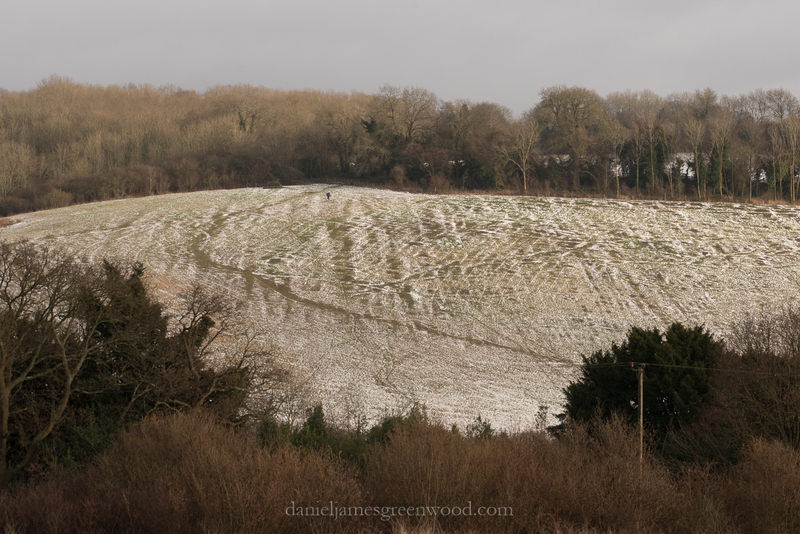 Climate change’s predicted course means that the snowy downs here as I see them today may yet be something that can only be spoken of in the past tense. So does the act of photography now morph into a sentimental act of conservation? Our species’ recent photographic binge, due to the camera phone revolution, means that snow will never be forgotten in image, but its sensuality can’t be felt in a jpeg or print. I forget these things so quickly when London’s short snowy affair departs, the glow of light from the white ground, the dripping trees, the soft press and crunch of boots, the sheer joy that children feel and express on their plastic sleds. Perhaps to us southerners who see so many different types of weather, the loss of snow’s short stint will barely be noticed. For climate change will bring profound challenges for species that depend on certain conditions, be they polar bears, butterflies, mushrooms or migrating songbirds. On the downs, like many thousands of others I’m sure, I seek change in itself. A different state of mind, of perspective, colours, textures and places to walk in. Nature reminds us always that change will come. Three o’clock and the sun sinks in the east, casting long rays of light through the papery sepals and stems of knapweed and agrimony, summer’s relics. Threads of spider silk drift between these old frameworks, a material stronger than steel by comparison. The experts will tell you that at this time of year birds depart the highest open reaches of the downs, and there are few birds around. This is the perfect camouflage for a crow, the sun so low and dazzling there could be hundreds of them chowing down on the edge of the hill. One lifts up, gliding on the wind, hovering kestrel-like, remembering its place. I came here with thoughts of waxcaps bright and beautiful, but two hours out here and I only find one picked and overturned. The life is being scraped from the downs by the raking wind, the tumbling temperature and coming dark, the slide into winter. Yet every seasonal change is the same, like a shift in human history, it is not one event that brings about the enclosure of darkness but several over time. You can find its waymarkers, indicators of something different on the horizon. Each season, like each era of civilisation, is a product of the ones which came before. The cows graze the grasslands, their coats lit red by the sun setting behind them. Their breaths puff out like smoke as they chomp. It is a reassuring sound, grass uprooted and chewed over. They offer few glances to those of us passing by this morning. Pied wagtails, a bird I don’t often see here, perch on their backs and pick at their pats. In the scrub slowly being cleared from the downs by the City of London, redwing break between hawthorn and rose, their wings lit as they break cover. 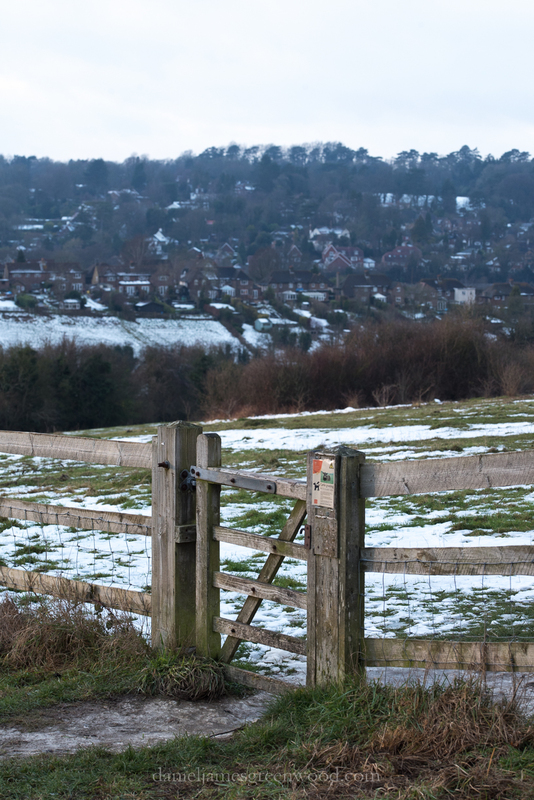 I know why this work is being undertaken, I’ve helped with it elsewhere on the North Downs, but I am losing my old signposts in this open landscape. The area where willow warblers once nested, where redwing and whitethroats used to feed up, a hawthorn where chafers fed one evening: all of it grubbed out, the soil lightly ploughed. This scrub is being cleared to allow the return of chalk grassland, one of Europe’s rarest habitats, much of which is found in England and a surprising amount in London. Our response to the clearance of trees is almost always emotional, that’s okay, but it’s important to know why it’s happening but equally important to ask why. ‘I’m lucky, I live just next to it,’ she says, making her way. I agree with her, she is lucky. Up ahead a figure sits on a mobility scooter next to the millenium monument atop the hill. They are taking pictures of the sun disappearing behind the hill. Knowing I’m part of the photos I stop and ask, ‘would you like me to give a certain pose?’ She laughs and throws out her arms to suggest a stance. ‘What camera have you got there?’ she asks, my camera on its tripod resting over my shoulder like a bazooka. ‘I’ve got a Canon but haven’t used it in a while,’ she adds. I don’t enter into the Nikon-Canon banter. I tell her that I’m not so local and I come here to get away from the SE postcode. She asks what I’m here to photograph, ‘wildlife?’ She has it right, but there are a disappointing lack of mushrooms. ‘It’s probably the wrong time of year for that,’ she says. It’s been the right time before but an anxious thought creeps in – does someone know the movement of waxcaps here in some kind of hyper-intuitive detail? Probably not, it’s just been a rubbish autumn for them. She recounts tales of campervan holidays out in the New Forest’s old military sites where she could bolt her caravan into the old RAF concrete and fly agarics fruited on her portable doorstep. ‘I’ve not been there for a while though,’ she says. ‘I was ill last year, and I’ve been ill this year, too.’ She nods as if admitting something. The sun has left us now, a few scraps of cloud coloured by the glow. ‘It’s called the green ray, there’s a French film about it called Le Rayon Vert,’ I say. Britain has descended into political turmoil, but out here on the downs normality persists. Summer’s flagship species are on the wing in the form of the marbled whites, meadow browns resting low down in the grass, feeding on hawkbits, hawkbeards or whatever these large yellow daisies happen to be. Yellow rattle flowers in its prime, this nationally rare flower in full voice on Farthing Downs. Now is the time to seek orchids, but so very many of them can be found in the right place it’s more a case of avoiding them. Pyramidal orchid, common spotted orchid and common twayblade gather in great number on one slope. Crab spiders cling conspicuous to florets, waiting for their moment. The birdsong has not yet come to its end: a whitethroat sits atop scrub not yet cleared, singing, preening and dropping down to safety, a skylark and a yellowhammer distant. The plaintive piping of a raptor can be heard and a kestrel with feathers lost skates across, disappearing beyond the brow of the hill. Crows raise an alarm, I scan the now open downs for a bird of prey. Crows, ragged and worried, fly across the roof of woods, and more alarm calls are made. A scuffle ensues, the brown of a buzzard’s wings, like melting milk chocolate in this light, is followed into the trees by crows. It’s usually where the battle ends. Trundling on in the growing heat, I pass through an area of oak, ash and bramble. From the long wash of pale grasses high as hips, a young deer bursts free. It jigs and jumps up, not so much running as bouncing along the sheltered belt of trees and bushes. It seems almost naked, in body and spirit, free of all sense. It ranges to obscurity. Soon a man dressed in a trench coat passes with his dog and their dwindling shapes swim in the overpowering scene of breaking sun and flowering grasses. Moving through the quiet of Devilsden Wood, the clamour of school children’s voices behind me, I quietly question the decision of motor cross riders to drive back and forth for half an hour along Ditches Lane. There is a sense of a hollowing out, the opportunity to express oneself without remorse now, at least since Friday morning. I walk through these woods, ancient, growing, and think of all they have lived through. The world wars, Napoleonic war, the Magna Carter, what about the Norman Conquest, the Roman invasion, even the Neolithic revolution of 6000 years ago? I don’t know. I leave the woods and its splintering blackbird phrases. Why do they still sing now, is there still time to breed? The meadows have thickened with grasses in one week, I rue their itchy monotony. We have experienced rainfall on an unprecedented scale, 40mm of rain in what Londoners call ‘the Brexit storms’. There are so few butterflies, only really the meadow brown, a creature that seems to endure rain, moves amongst the flowers. I feel ripped off, dispossessed. I dream of these meadows in winter. Now they have been reduced. Heading back I see a figure on the hill with a guitar. In five years I’ve never seen someone like this here, a place mainly of dog walkers, horse riders, retirees exploring the London Loop and the weekend charge of cyclists. I approach him. He begins playing a song but can’t remember who it’s by, someone American, slapping his wrist against the hollow body of the guitar. When he finishes I ask him what he thinks about the referendum. I thank him, Marco is his name, and point him towards Happy Valley. You can go that way and walk for weeks, I tell him. It’s something I always dream of doing, ambition reduced by its likely pain and lack of time to do it. I leave him to practice, flecks of struck guitar strings ringing out from the crown of summer downland. London’s mini heatwave has closed its doors, great grey clouds entomb the downs. In my mind the meadows have all flowered and gone, so quickly has the psuedo-summer taken root. Sunday’s 27 degrees felt more like July than May. Gladly, at Farthing Downs all of May’s icons can be found: meadow buttercups, silverweed, yellowhammers singing in flowering hawthorns, cowslips moving to seed. A strange song emanates from the young trees grown too woody for livestock to graze. At first I think it might be swallows passing through, zipping and chattering, then perhaps baby birds. Swifts swoop overhead but no other hirundines are here. The chattering song continues and I move closer. In ash, bramble and oak twigs the white throat of that very bird flashes. It jumps up onto a branch and I photograph it, a white bud or bug of some kind in its bill. The whitethroat has travelled from Africa to be here on the North Downs, a journey we cannot quite comprehend. Except we Europeans too came from Africa, but it took some 60-100,000 years to do it rather than a few months. This whitethroat is not alone. Behind me is a bigger clump of trees and scrub, a thicket of ash trees riddled with canker. I’m listening to a song that I expect to hear in passing every April here, like a little chain tinkling, or some early mechanical clock. It’s a lesser whitethroat, another arrival from Africa. But I can’t see it, listening closely for a sign of whether it’s under cover or out in the open. I give up. A kestrel appears from over the whitethroats’ bushes, gliding, hovering and slipping off. Rainfall on the downs. Still the jackdaws toe the grasslands in their flock, still green woodpeckers cut arcs across the landscape, still the spring’s song builds in hedgerow blackbird music. Linnets flock to the small bushes of rose and hawthorn, skylarks lift from the turf, dropping back down onto the grassy mounds of anthills. So few flowers, but rosettes are massing at the margin of soil and sky, the dropwort, rattle and eyebrights feeding on the thinnest layer of nutrients, readying to flower. But the rain still falls and so I make for Devilsden Wood where bluebells have peeled from green to that almost purplish colour. Our common name feels a little inadequate. But then that’s the joy of common names, there are so many, they each tell a tale of our senses through time. Wood anemones, probably my favourite flower, were known as windflowers because people thought that they only opened their petals when the wind blew. Here they bloom in their little flocks amidst dogs mercury and more bluebells.